Happy Labor Day Weekend! Well, it’s official … the kids are back in school, and summer vacation is over. We have a tradition in our house, that I love, to celebrate Labor Day. It is the perfect way to relish one last warm summer evening with the family before the busy school year starts, and the leaves begin to fall. 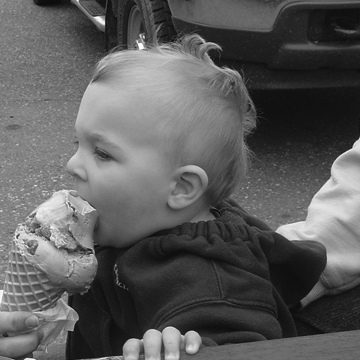 Each labor day we have ice cream for dinner! We tell the kids in the morning and they look forward to it all day, contemplating what flavor they will get as they send off summer till next year! We head down to our favorite little ice cream and candy shop in our town and relish our time together as we eat a fun dinner covered in sprinkles and chocolate syrup. I hope it is a tradition that they kids look forward to each summer as they get older, I sure do. I will never forget last year. Olivia was standing on a bench next to me covered in ice cream from ear to ear, in her hair, down her arms, I believe it was blue! She wrapped her sticky little arms around me and planted a big old sloppy ice cream covered kiss on my cheek. My husband cringed as he watched her reach for me, but I threw open my arms and welcomed the sticky sweetheart’s kiss. Matt asked why on earth I let her do that, and all I could think was that, some day she won’t even want to sit next to me on this bench, let alone lay a big hug and kiss on me, in public! I better take it when I can get it, right? It is a moment that I will cherish forever, all because we went for ice cream FOR DINNER! Kim, I so glad you started a blog! I love it! You’re a great writer and an even better mama. This is going to be one of my favorite blogs! Awww! You are so sweet! I am so glad you like it!! It has been really fun so far!